Our Rugged Rebel Buckle is made of solid metal and sold at a reasonable price. 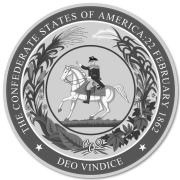 Surrounding its centerpiece are the 13 States which seceded from the Union in 1861 to form the Confederate States of America. Being a REBEL is an American tradition! Get your Rugged Rebel Buckle today.